Inside the Capri these days, it could be easy to get caught up on the crumbling walls or the light that shines through the gaps in the ceiling above the stage. While these things might dissuade the casual concert-goer, most appreciate the charm and love the Capri more for it, as it has become kind of a community center for the Jackson music scene. On a grander level, the Capri’s warts hold the stories of the rich history of the theater. The Capri, originally named the Pix, got its start in 1939 from a community member who circulated a petition requesting permission from the City Commission to build a “moving picture house” on North State Street. Opened in 1940 as a member of the Paramount-Richards chain, the Pix would be Jackson’s first neighborhood movie theater and the first theater in Jackson to have wall-to-wall drapery, Xenon lights and rocking chairs. The first movie theaters came to Jackson in 1907, and by the years following World War II, as all time cinema attendance records were being set around the nation, upwards of a dozen movie theaters were in operation all over Jackson. But towards the end of 1950, as the majority of U.S. households acquired televisions, cinema attendance steadily declined. With the growth of automobile ownership, the new theatres that did open tended to break ground in the suburbs, to follow the people and their cars. In 1950, the Pix lost its chain backing and became independently run. The television-automobile effect hit the Pix in 1957, forcing the theatre to shut down until 1962 when it reopened as the Capri. This incarnation of the theater was successful for a while, but with the advent of multiplex cinemas in Jackson showing exclusive first run Hollywood hits, such as the Jackson Mall Theatre and Ellis Isle, the Capri couldn’t keep up with its reliance on second run features. By the mid-1980s, the Capri had been resurrected once more, showing cheaply produced adult films. One writer to the “Jackson Daily News” Jack Sunn in 1984 spoke to the theater’s state, ironically writing that the Capri was “stuck between a rock and a hard place.” Shortly after, the Capri closed, seemingly for good. Over the years, different efforts have been made to restore the Capri to its former glory. Since 1999, ownership has changed hands several times as plans are made and abandoned. 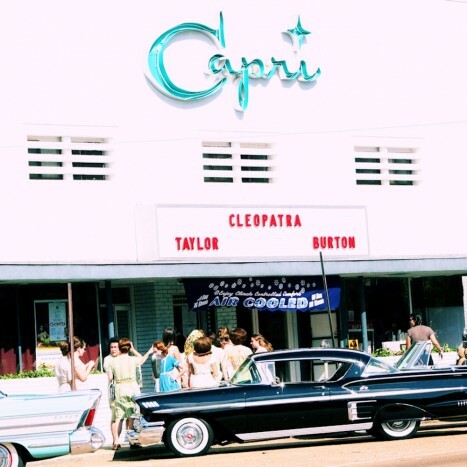 Hopes are high with the recent ideas about the possible future of an expanded Capri, re-opened as a multi-screen theatre with full dinner and bar service. No matter what, the Capri has already returned to its roots in a DIY sort of way, a testament to the sense of community shared in Fondren.